PackHedge™ is the world’s most advanced investment industry solution for multi-asset classes; Alternative and Traditional investments including Hedge funds, Private Equity funds, Mutual funds and many other investment instruments such as UCITS, ETFs, Equities, Real Estate, etc. empowering qualitative and quantitative research and analysis. PackHedge™ provides comprehensive portfolio construction, simulation, what-if modelling, tracking and management tools of mixed assets types to enhance the investment decision and management processes. The Portfolio tools provide comprehensive transaction based portfolio management shadow accounting for managed accounts and/or funds of funds. Using any combination of price/share or amount based investment instruments. Allowing master-feeder and/or more advanced proportional accounting. Private Equity funds can be created defining Purchase Unit as “Amount” as opposed to “Shares”. The Amount Fund type can be used for Private Equity, Real-Estate Funds and other investment vehicles based on investment amount versus shares/price. One or any number of P.E. fund(s) can be included in a portfolio so that the necessary information such as commitments, contributions, distributions, etc. can be captured as transactions. All Portfolios can also contain any mix of any types of investment vehicles (P.E. Funds, Real-Estate, Hedge Funds, Mutual Funds, Equities, custom instruments, etc.). The Portfolios also provide a comprehensive cash flow analysis and projections, with all the relevant P.E. performance, ratios and PMEs, J-Curve analysis, as well as what-if scenarios. Offering a sophisticated query engine with a user-friendly drag and drop selection process, PackHedge™ allows for in-depth screening on thousands of qualitative and quantitative data points. Statistical analysis, Risk Analysis and charting can be conducted on single or multiple assets for identifying potential investments and monitoring current ones. PackHedge™ offers a wide range of the most advanced quantitative analysis and charting tools and methods on individual assets, multiple assets or portfolios. Quantitative tools include: all industry statistics, currency hedging, stress testing, scenario analysis, sensitivity analysis, portfolio optimization (both Classic & Black-Litterman), style analysis, peer group analysis, exposure/segmentation analysis, contribution analysis by a range of statistics, attribution analysis, extensive risk analysis, PCA (principle component analysis), cluster analysis, Monte Carlo projections/analysis, Fama French analysis, proxy configurations, etc. Qualitative information management tools and analysis provide for custom fields, custom time series, custom definitions/taxonomy with synonyms, notes and pseudo-static data management, etc. Qualitative tools include: custom due diligence, comprehensive CRM (client relationship management), Outlook synchronization for contacts, emails and attachments, integrated document management, workflow management tools including setting reminders, rules, limits and alarms, compliance, KYC and much more. PackHedge™’s user friendly, powerful and flexible Screening & Reporting engine provides a multi-dimensional query engine combined with a powerful & flexible custom reporting tool for assets, portfolios, aggregated portfolios and/or any type of asset or object. Customers can choose from a wide range of standard reports provided with PackHedge™, simply customize these reports and/or easily build their own custom reports from scratch. Reports can be formatted in any combination of Excel, PDF, HTML and/or Jasper Reporting. The batch reporting tool allows the production of any number of reports to be produced on any number of assets and any number of report formats with just one click or via the Scheduler. Workflow Management tools to custom define workflow steps and periods for monitoring, reminders, tracking and reporting, setting rules, limits and alarms on any quantitative and/or qualitative parameters. The Scheduler allows multiple tasks to be scheduled for periodic execution at predefined dates/times, substantially improving productivity. These tasks include; report production, query production, production of all PackHedge™ analytical functionalities, Portfolio valuations/calculations and the automation of data vendor downloads, import and merge. The workflow & process management tools are used to assist with and improve Compliance, Know Your Customer (KYC) and Due Diligence as well as providing Document Management and Outlook synchronization of contacts, emails and attached documents. Use the PackHedge™ tool to design custom Due Diligence Questionnaire(s) (DDQ), with a simple click all the DDQ information is imported into the PackHedge™ database and available for all the analysis and reporting that may be required. A series of state of the art modular tools in a single fully integrated platform, providing an unmatched data management model. 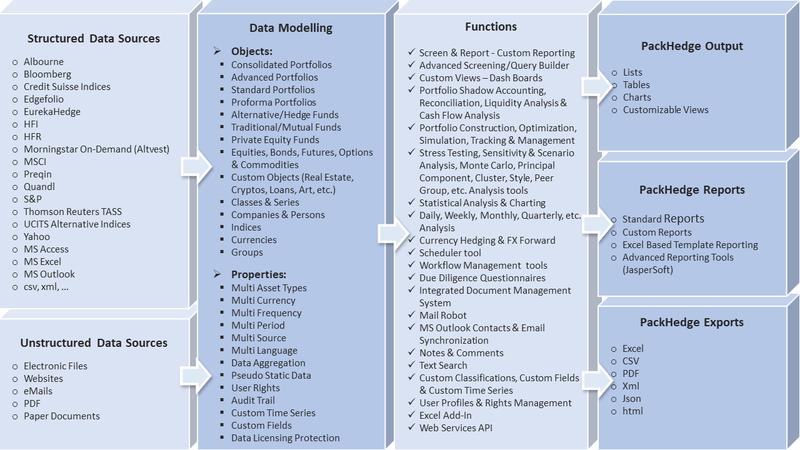 At the core of PackHedge™ is a unique and extensive data model for qualitative and quantitative information that merges and aggregates multiple data sources, multiple data frequencies, multiple data types, multiple languages and multiple currencies to provide individual sources and/or an optimal aggregated series (OAS) of data across any number of sources. The OAS is the most accurate and most complete set of data available across all the data sources with a complete audit trail. PackHedge™ is built on a true data aggregation model, integrating data from most of the industry’s data vendors as well as client data. Data management provides tools to ensure full data integrity such as Audit trail, Structured data fields, Pseudo-static data management for qualitative data, Custom Time series, Custom Fields, Fund Master-Class-Series structures, data Field inheritance and much more. The data feed update manager and import/export tools to manage time series, qualitative data, transaction data and custom due diligence questionnaires are also provided as well as a powerful Web-Services API allowing data interchange with other client systems. The design of the PackHedge™ user interface conforms to Windows standards. Custom Tabs & Views for quick monitoring of general overviews, risk overviews, due diligence overviews and many other monitoring & reporting capabilities. Users can chose which tabs to automatically display by object type or by individual object, they can design their own Custom Views (Dashboards or Cockpits) providing windows containing the information they wish to have displayed on any asset or object. Custom Objects allow users can define any type of investment vehicle with a time series allowing portfolio construction and management of any types of assets. Custom Fields & Custom Time Series allow users to define Custom Fields on a separate main tab within each object type. With field label and field type definitions encouraging structured data management and which include; text, number, number/currency, date, drop-down-menus, etc. Custom Time Series can be used to track any type of time series. Customize the Browser, Object Manager & Tool Bar so that each user can define their working environment to ensure efficiency and productivity.